I love how the wind is affecting the incoming waves. Along the Atlantic coastline in Bathsheba, the pounding wave action has eroded the base of many huge coral rocks. Awesome scenic views result. 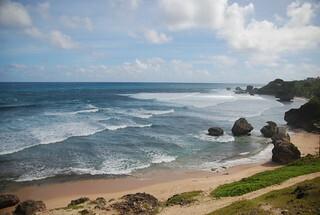 The surfing is also excellent here, with Bathsheba being used as the site for international surfing contests.